never be afraid of your computer again. enjoy your digitizing watercolors process. learn how to match your digitized designs to your original paintings. create print-ready and web-ready designs so you can confidently add them to your shop and sell them to your sweet clients. Enroll in the digitizing watercolors course! do you love creating original paintings and/or brush calligraphy pieces, but often find yourself wondering, "how on earth do other designers scan & edit their work?!" Feeling stuck in your business, because in order to truly grow - you need to be able to print your designs or offer them digitally? All you're comfortable offering right now are original paintings, but you can only take on a few of those each month - and you're not sure if your business will be able to survive that slow growth. Hand painting each individual greeting card or art print you sell in your shop - even if it is the same exact design - because you're just not sure you'll be able to match that gorgeous original painting color and quality with a digitized and printed reproduction? Spending hours googling tutorials, only to realize that most of the Photoshop content out there is just for photographers - and you just wish you had a guide for editing watercolors not photos? Sure, you can piece together the photo tutorials - but that would take hours/weeks/months, and what if those techniques don't even work for your paintings?! You then start to think, "Too hard! Ugh! I give up!" Thinking, "Wait. Is Photoshop even the right program for me to be using? Is it the only Adobe program I should be using? If not, what else should I use? And what are those other programs supposed to help me do? Do I have to learn ALL the tools of EACH program to be a good designer? If not, which ones should I learn? OMG. I'm never going to learn. I give up. Again." Just. So. Dang. Frustrated. At. Getting. Rid. Of. That. Paper. Texture. Background. Feeling like you'll never be able to paint with blush, ivory, or other light colors again - because each time you attempt to digitize light colors, they get erased for good! There has to be a better way - I need my blush!!! Curious, wondering where you then take your digitized designs to have them printed once they're edited and prepped for production. Kinkos? No...surely there's a better option than that! Thinking, "Oh but wait, before I send my client's design to print...how do I show it to them for proof approval?!" Wishing you could just copy a step-by-step proven process. but become a profitable business, too. to finally turn your designs into stunning shop products. to have an online community of talented & friendly artistic peers. to learn digitizing at home. with a glass of wine... on your own time. you could digitize like this, too! the digitizing watercolors course will provide you with my step-by-step process to guarantee high-quality, crisp watercolor designs that accurately match your original paintings & brush calligraphy. designs you cannot wait to print & sell, or provide as gorgeous digital designs to your sweet clients. get the payment plan & start now for just $97! here's a glimpse into what you'll learn to digitize! The Digitizing Watercolors course includes 9 core lessons that guide you through how to scan your artwork, how to edit your colors to best match your original paintings, how to remove that pesky watercolor paper background (without permanently removing ANY of your artwork!!! ), how to save your designs, and how to prep them for both print & web - so you'll walk away with two beautiful art prints, a custom stationery set, and a new iPhone background!! ...all which you could then sell in your shop! I'll share my absolute fave art supplies I used to create the floral & calligraphy pieces. I'll of course also share a detailed look at the Adobe Creative Cloud, which programs I love to use, and how you can get a free trial! This lesson delves further into each Adobe Creative Cloud program we'll be using in the course! I'll show you the back end of each program, so you can start getting comfortable as we begin our digitizing process! This lesson is jam packed with lots of detailed info about the first method I used to use when removing my paper texture background. It will get us super comfortable with Photoshop and all the various tools! Now that you're comfortable in Photoshop and have a foundation for one way to remove your paper texture background - I'm going to show you my new method I use! In this lesson, we'll go over how to do a couple quick touch-ups, to ensure they best represent our original pieces! I'll show you the 2 steps I take each time I'm finishing editing my piece in Photoshop! Alright y'all - super important lesson! How do we actually save the designs we worked so hard on for print & web? I'll show you my favorite save settings I use for my watercolor designs! creating designs for print & web + course projects! Fun project time! In this lesson, I'll teach you about Illustrator (only the important parts!) and how I use it to design print & web designs. You'll make 2 art prints, 1 custom stationery set, and 1 iPhone background! Did ya think you'd just get those incredible 9 core video lessons? Oh no, friend - so much more! Bonus Video Lessons: So you can continue learning digitizing tips & tricks with practice prompts - so you won't give up!! Supplies & Softwares List: So you can confidently know which programs you'll need + art supplies for new practice paintings! Digitizing Watercolors Check List: So you can have a written step-by-step guide of everything I'll teach you - with check boxes next to each step to make sure you don't miss a thing! Photoshop Adjustments & Tools Guide: So you can remember which tool to use to create unique effects! Printing & Production Partners Guide ($137 value! ): So you can confidently send your digitized designs to print, using the same exact vendors I trust & use! 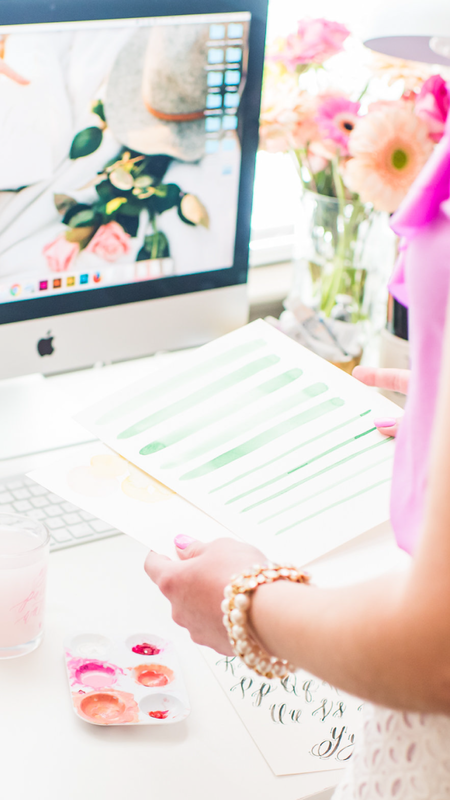 Stationery & Art Print Templates: So you can easily design print-ready files! I know how scary it can feel to learn a new art form or method on your own. And I of course want to make your learning process as fun and comfortable as possible! That's why you'll be hearing from me personally through email check-ins so I can make sure you're keeping up with your lessons & homework! so you can immediately test printing & add shop products! yesss, i want to become a digitizing pro now! get the class payment plan! If you're still looking for the perfect holiday gift for your artistic friend, gifting them with a gift card to one the digitizing watercolor course will surely grant you the best-gift-of-the-year award! Do I have lifetime access to the class? Yes, of course! You have lifetime access to this class (and any of the SJM Art School classes you enroll in) - plus you'll get lifetime updates to the classes if I change anything! AKA if Adobe changes something and there's a cool new helpful tool, I'll teach ya about it! What design programs do I need to enroll in this course? I highly recommend investing in the Adobe Creative Cloud!! I use multiple programs from the Creative Cloud, so investing in the full Creative Cloud is more cost effective than buying each unique program separately. But don't you worry - you get to test them for free! Adobe has a free 30 day trial of their Creative Cloud (which I'll also share your link to inside Lesson 1!) so you can decide if you do want to get the whole Creative Cloud, or just download the individual programs we'll use. Which of course, I'll detail in much more depth inside the course! I'm a brush calligrapher but I don't paint florals - or - I'm a watercolor artist but not a brush calligrapher. Will this course be beneficial for my unique niche? Heck yes, friend! I recorded the same video lessons for both our brush calligraphy and watercolor floral paintings. That way, you can just watch the lesson that pertains to you. I do definitely recommend watching both however - because I may go more in depth in one lesson and it's always great to get as much practice as you can by watching all the lessons! Do I have to have a business to take this course? Nope, but it's a GREAT way to help you build a business! This course is your perfect next step from taking your original artwork and prepping it for print and web. Since you'll already have the print-ready and web-ready design files, why not make use of them and produce them through the vendors in my Printing & Production Partners Guide?! How long will it take me to complete the course? The course lessons are just about 10 hours in total. I want to make sure you get the most value for your purchase, so I've jam-packed information in the course! Don't worry, you have lifetime access so you can go at your own pace - and I recommend watching each lesson as many times as it takes for you to feel comfortable and confident in that new skill, before rushing onto the next lesson! Do I have to live in the USA to be a student? Nope! We have lots of amazing international students - from Australia, England, Canada, and more! That's the perk of online courses :) Some of the vendors in the Printing & Production Partners Guide you'll receive are US-only, but others do ship internationally! Do you offer any refunds? Yup! 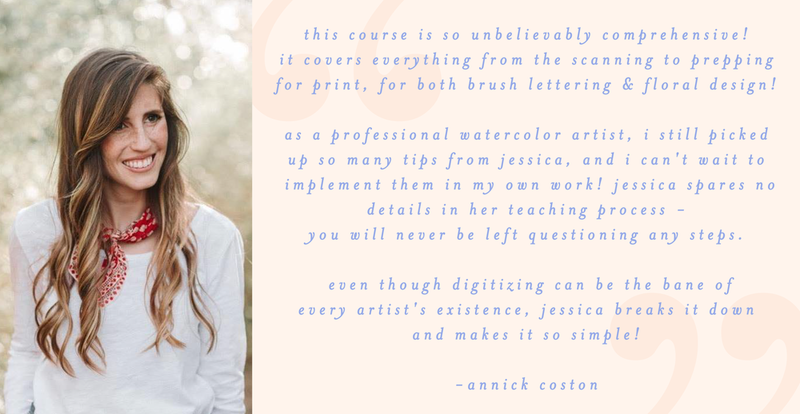 If you take the course within 30 days of enrolling, practice each lesson and show me your homework - and I don't see any improvement in your digitizing watercolors skills, I'll give you a full refund! Risk-free choice, my friend! get one course free & enroll in the full semester!